I am a complete novice; where can I go to learn this stuff for myself? Some teachers are able to work through the material independently, although this may not be preferable for those who have never programmed before. How can I improve or refresh my own knowledge about the course topics? The best way to do this is to actually set aside a few hours and run through part of the course yourself. This will familiarize you with both the course material and the nuances of operating the software. What do I need to know in order to teach this class? Instructors should have a basic familiarity with programming, and preferably some experience with LEGO or VEX IQ robots. I’m a parent and would like to participate. How would that work? For purposes of the CS Summer of Learning, parents and homeschool teachers can just follow the regular teacher directions wherever they appear! What is the purpose of the camp? The camp is being sponsored by Carnegie Mellon's Robotics Academy, and is designed to teach new programmers basic programming skills. Who can host a CS-STEM Summer of Learning camp? Any teacher, parent, or coach can host their own CS-STEM Summer of Learning camp. I am a teacher that is interested in running a camp, can I charge students to come to my camp? Absolutely, your time is valuable. If you make the camp free, there is a possibility that parents may believe that the camp has no value. What age group is the Summer of Learning camp geared towards? The camp is designed for students 8 years or above. We believe that the majority of campers will be middle school age, between 11 and 14. What are the minimum requirements to run a camp? Computers that are capable of running Robot Virtual Worlds software. Please see the System Requirements. Basic understanding of programming. The online training material are designed to guide new programmers through the lessons in a step-by-step manner, but students may need assistance with more advanced topics. Is there marketing materials and other forms available if I want to run a camp? Yes! Located above are documents and forms that will help you get started. Each document are editable through Microsoft Word so that you can adjust the information accordingly. Will there by any training on how to run the camp? Yes! The Robotics Academy will host a training and Q/A session for all teachers, parents, and coaches interested in hosting a camp in the first week of May. If you are interested, please register for our SOL 2016 newsletter (located on the Overview section) for the latest information regarding these sessions when they are made available. How can I contact the Summer of Learning programs with questions and comments? You can use CS2N support and mention Summer of Learning 2016, or post a question to our Facebook page. What if I am using MAC OS X? You can use MAC OS X to go through the course, but ROBOTC and Robot Virtual Worlds requires a Microsoft Windows OS. Both ROBOTC and Robot Virtual Worlds are compatible with softwares such as Parallel Desktop, VMWare Fusion, or running Windows natively by using Apple's Bootcamp software. How much does the ROBOTC/Robot Virtual Worlds software cost? Students that sign up for this Summer of Learning Camp will receive a free version of the Robot Virtual Worlds software to use camp or at home from May 1 until August 30. When will my software expire? Users will have free access to the ROBOTC and Robot Virtual Worlds software through August 30, 2016. How do campers earn an Introduction to Programming Certification? Each camper will need to create and use a CS2N account, and log in. As campers complete the programming challenges and lessons, they will be awarded digital badges that lead them towards the Introduction of Robotics Programming Certification! If you have access to creating a Group that allows you to give Student Exams, you may run into an issue where the student "won't have access to the exam". In most cases, it means that you haven't added the Student Certification exam. To do this, go into your Group, and click on "Settings". Scroll down to "Add Another Activity", and add the correct "Student Exam" to your course. Currently, Teachers can create a Group for a CS2N Competition or a few select CS2N Learn courses. Click on Create Group on the My Groups page to get started. Note: You must be set as a Teacher. Go to "My Account" and set yourself as a teacher. You can follow this Tutorial to help you create a Group. If I join the project, what is the benefit to me and my school? You will receive free training and software for you and your students to use. You will have the opportunity to earn a certificate that documents that you are certified to teach Computer Science at the middle and high school level from Carnegie Mellon University Robotics Academy. You will learn what it is to conduct educational research. What will be required of me and my school? You will be required to be part of summer professional development (PD) training where you will learn the pedagogy of using robotics to teach CS and Engineering. You will be asked to implement the curriculum in your classroom using the same methodology that you were taught in the PD sessions. Your students will be required to take pre and posttests to measure their learning gain (the post-test can double as a unit exam for your class). Your school must allow you to teach using the software and methodology that our team will prepare you with. What happens if I sign up and then find out that this is not what I thought it was going to be like? We hope that doesn’t happen, but if it were to happen there are no legal obligations that you continue with the study. What do I need to do to become part of the project? You will need to fill out the form above and click the "Subscribe" link at the top of this page so that we have your contact information to participate in the project. My students don't have email addresses. Can I use mine? That way, you get the emails, but they actually exist as separate accounts. Please note that you will receive the emails that the student would normally get. How do I print a Certificate once I've earned it? To print your certificate, please navigate to cs2n.org/u/achievements and click the "Certification" achievement icon. You will then see a screen that has a "print" button under the achievement icon. 4-H Activity: I can't find Activity 6, Program 2. Where is it? That's the activity you want to look at. In Robot Virtual Worlds the robot performs differently for the same piece of code. Why? The sensor data that the virtual worlds sends to ROBOTC is framerate dependent. If your computer is not providing consistent performance, the framerate can fluctuate causing some inconsistencies. To help with this, we recommend closing unnecessary programs, and upgrading to the latest version of the Curriculum Companion, Palm Island, and Operation Reset Virtual Worlds, which all have new graphics quality settings. You can turn the quality down to help your computer achieve consistent performance. I was interrupted in the middle of a quiz or test and couldn’t get back to it before the time limit ran out. What should I do? If the course is self-guided (doesn't have an instructor), you'll have to use our contact form to let us know to reset it. If the course is led by an instructor (usually one of our Robotics Academy on-site/online classes or it could be a Group-led course), you'll have to ask your instructor to reset your attempt. I tried to download the free VEX ROBOTC Summer of Learning program after I had already downloaded the LEGO ROBOTC program, and the installer keeps crashing. How could I get both licenses at the same time? The error you're seeing might be the Error 1316 one that occurs when you already have ROBOTC installed. As for the licenses, if you already had ROBOTC installed, you can go to the Robot Virtual Worlds page and look on the right for the special ROBOTC license. Where can I find more information about ROBOTC? If you need help with programming or want to learn more about different programming structures and functions, check out the ROBOTC API Guide. 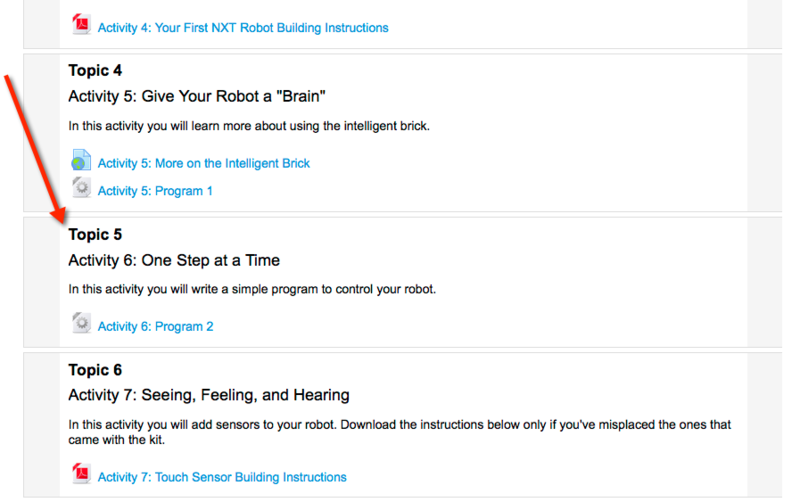 ROBOTC supports many more functions than are taught in CS2N courses; you can find a full list there. How do I “Zip” files for submission to a competition or assignment? On a PC, you can put your files in a folder, right click on the folder, and select “Send to” then “Compressed (zipped) folder.” Your new zipped folder should appear near the old one. On a Mac, you can do something similar: put all of your files into a folder, right click the folder, and select “Compress ‘(folder name)’” Once again, a nice zip file will appear in the same directory as the original folder. When will I get a response back from a “Contact Us” form? We should get back to you about your question within one or two work days. I can’t open a file for one of the courses. What do I do? Try clicking on the logo for the file if clicking the text is not working. If that doesn’t work, please send a comment to us through the “Contact Us” form – we’ll try to fix the broken link as soon as possible. Does Robot Virtual Worlds work with Windows 8? Yes, Robot Virtual Worlds (and ROBOTC) works with Windows 8. I get an Error 1316 when installing Robot Virtual Worlds. How do I install Robot Virtual Worlds? The sign-in window only displays a small portion of the window. I can only put in my email. In the past this has usually been a browser compatibility issue, which is usually caused by the use of an old browser like Internet Explorer 6. I suggest upgrading your browser to the latest Internet Explorer, FireFox or Google Chrome browser. I'm having issues with Robots In Motion. Nothing loads. What can I do? Robots In Motion requires Adobe Flash to be installed as well as a few other requirements. In most cases, your school's network may be restricting access that Robots In Motion requires. My child wants to go through a CS2N Learn course and does not belong to any team or school. Can he/she go through it? Yes! Our materials are up and are available to the public so your child is more than welcome to go through our materials. When can I begin to use groups? Note: If you don't see this option, go to your "My Account" page and set yourself as a Teacher. Who can see the pages that I've published? Anyone with the link! The pages you publish are are public. That said, Mozilla has controls in place that will not allow search engines to index the pages - that means your page will not show up in Web search results. Mozilla also didn't create a big list of all the pages that people have made, so if you've published a page and you're not entirely happy with it or you don't want to share it, simply don't give people the link. And if you're really unhappy after publishing, you can contact Mozilla to remove the page you made. See the "how do I unpublish or delete my published page?" question, below. How do I unpublish or delete my published page? Write an email to thimbleundo@mozilla.org with the URL of the page you'd like deleted and they'll remove your page as soon as they can. Where are my Thimble webpages hosted? By default when you publish your webpage, it is hosted by Mozilla. If you want it hosted someplace else, you can still use Thimble to design and build your webpage. Just cut and paste the HTML when you're done. Voila! How do I upload images/videos? Thimble doesn't support uploading images or video, but it does allow you to link to hosted images and video on popular services like Flickr, Vimeo or Youtube. Trying using the <img> tag in the editor for images. For videos, you cannot currently use the <video> tag because of security reasons, but you can pull in video using the <iframe> tag. Help! I didn't save my page's URL. How do I get it back? If you open the Thimble editor page in your browser within a few minutes of accidentally closing it, Thimble will automatically recover your work for you! However, if you wait longer than that, Thimble won't be able recover and you will have to start from scratch or redo a project. Although the word "hack" may have some negative connotations, the Open Web community uses it in a positive context. To "hack" something is simply to take something that already exists and change it to make something new. You can hack physical things- like board games or you can hack the web. Hacking has always been a key element in the creative process. It is a constructive collaborative activity, not a destructive one. We have an unique definition for hacking. When we say hack we are talking about remixing content to make new things for the web. We mean hacking as tinkering. We are not implying anything malicious or illegal. Why is teaching kids about the web and hacking important? Beyond technical knowledge, Hackasaurus helps develop “hacker habits” — the combination of technical and social skills youth need to become active co-creators, shape their environments, and take charge of their own learning. In this fast-paced world, it’s important that youth understand how to tinker with technology rather than just consume it. Is Hackasaurus available in languages other than English? Hackasaurus has been localized into 15 languages. You can change the language on hackasaurus.org (dropdown in the lower right hand side). We're always looking for community members to help localize all of the content on the website, the educational resources and the tools into more languages. To learn more about Hackasaurus localization, visit the following link. What browsers do the X-Ray Goggles support? Right now the Hackasaurus tools work reliably on the latest versions of Firefox, Chrome and Safari, but support for more browsers is on the way. What happens when you publish your hack online by clicking the "P" key? The hacks are stored on a separate internet domain from the original site they were on. For instance, when you remix facebook.com, your published hack will be hosted on remixes.hackasaurus.org, which is a distinctly different place on the Web. That said, your remixes are publicly visible on the internet by anyone for all time--so don't be surprised if the hack that you made to make fun of your parents comes back to haunt you! If for some reason you published a hack in error, please email Mozilla at remixes@hackasaurus.org if you'd like us to take it down. How can I help my students during peer evaluation? We encourage teachers and leaders to coach students on how to provide constructive criticism. Students who can pick out what worked well and what didn’t in their peers’ works builds their critical thinking skills. Students who can write down their analysis and phrase it constructively builds their communication skills. What if a student doesn't take the rating task seriously? Students who evaluate the work of their peers, in turn, receive an evaluation rating based on assessments from the peers they evaluated. This rating will weigh against their evaluations to affect their influence on the overall evaluation. This system will help reduce the influence of ratings from students who do not take the rating system seriously. Will students pick the entries to rate? No. The evaluations will be distributed randomly. What if a student receives inappropriate feedback? Our experience is that evaluations tend to be positive and helpful. This is due to three reasons. 1. Students are not anonymous – comments can be tracked to the student and they feel accountable. 2. Students are prompted to be put in a coach role vs. a random spectator role. 3. Students know their work is also being critiqued. What kinds of comments are appropriate in the evaluation phase? Students will be asked to say what they liked about the submission they are evaluating and give feedback on what needs to be improved. The overall goal of the evaluation process is to get everyone constructive feedback designed to help them with their next animation project. Will students have to evaluate all the entries? No. Students will be required to evaluate five entries over a two week span. Why are students evaluating each other’s work, instead of a judge or panel? Peer evaluation provides additional opportunity for students to learn. A group of qualified judges will make the final determination of prizes. Students will be given five random entries of students in their age group to evaluate based on CS2N developed rubrics that every participant will follow. Once the evaluations are complete, the students will assess and rate the helpfulness of the evaluations they received. About how many hours will it take for a student to learn how to use the programs and then do at least a basic job on their entry? Alice: After initial setup, children can be up and programming in Alice in 3-4 hours. SAM Animation: After initial setup, children can be making animations in minutes. What is the typical grade level for students using SAM? SAM Animation is generally targeted towards children in kindergarten and up. What is the typical grade level of students using Alice 3? Alice 3 is generally targeted towards children in tenth grade and up. What is the typical grade level of students using Alice 2? Alice 2 is generally targeted towards children in sixth grade and up. Which programs can students use for the competition? Should students work alone or in teams on their entry? The project is designed to be completed by one student. Badges and prizes will be awarded to single student.